This Chunky Hexagon shaped ring is very comfortable to wear and made from 5.00mm wide sterling silver band and has a rustic textured surface which gives this ring a contemporary look. Available in bright silver or oxidised finish. The Chunk Hexagon ring is currently made to order (5-6 days delivery), if you would like it without the textured surface then please select the finish and size using the drop down options below. 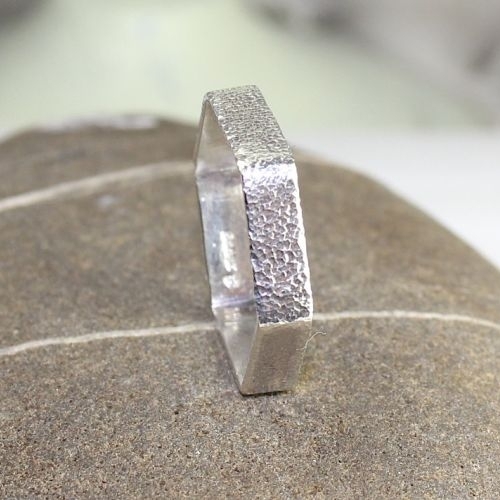 This stylish ring has full UK hallmarks and is designed and handcrafted in the workshop by me! Your Chunky Hexagon Ring will be presented to you in one of our signature gift boxes and posted via Royal Mail 1st class recorded delivery (signed for) to any UK address free of charge.